New laboratory tests are now available to evaluate total diet NDF digestibility (NDFD) and provide laboratory energy estimates for total mixed rations (TMRs). Laboratory TMR evaluation can be used to cross check possible errors associated with formulating and mixing TMRs or can be used to assess possible assumptive errors in formulating ration energy density. Nutrients in TMRs are generally measured using wet chemistry laboratory procedures and energy estimates (TDN, NEL) are made using coordinated bio-nutrient summative models (NRC, 2001). Because accuracy and precision are paramount to estimate TMR energy content, laboratory TMR analysis requires excellent sampling procedures. What does the laboratory measure in a TMR? The CP, NDF, Fat, NDF digestibility (NDFD), Ash, Ca, and P content are the base nutrients typically measured in TMRs by the laboratory. Of critical importance is the measurement of NDFD which is used to estimate the energy available from NDF. The NDFD of a TMR is typically measured for 30 or 48 h in vitro using rumen fluid from a canulated cow. The digestibility of NDF in the TMR is required to make TMR energy estimates. How much can NDFD vary in a TMR? 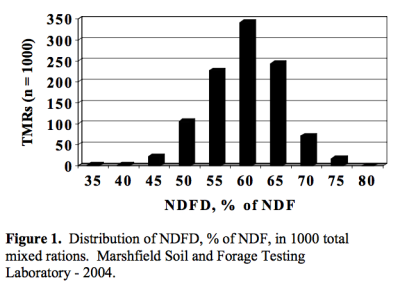 Presented in Figure 1 is a summary of NDFD values for 1000 TMRs evaluated at the Marshfield Soil and Forage Testing Laboratory. The NDFD, % of NDF, can vary up to 30 percentage units between TMRs. This variation is seldom taken into account in ration formulation and can have a major impact on dry matter intake potential and energy density of the TMR. Controlled research has demonstrated that high producing dairy cows will consume more feed and produce more milk when fed feeds containing NDF that is highly digestible. What is the utility of a laboratory TMR analysis? The utility of a laboratory TMR analysis is to re-evaluate the nutrient composition of a TMR that was actually fed to animals. The values from the TMR report can be compared to the ration formulation and potential inconsistencies can be identified. If the formulated nutrient content of a TMR does not closely match laboratory one of three reasons exist: 1) The TMR was not mixed to ration formulation specifications. 2) The ration formulation process lacked information or contained false information (e.g., inaccurate forage test). 3) An unrepresentative sample of the TMR was sent to the laboratory. The main utility of a laboratory TMR analysis is to evaluate if the TMR actually contained the desired nutrients as per diet formulation and were properly mixed and delivered to the animals. Laboratory evaluation of TMRs can also provide insight into nutrient management programs especially pertaining to phosphorus. Total dietary phosphorus levels can be checked and monitored to avoid over-supplementation and corresponding elevations in manure phosphorus levels. How much nutrient variation is in TMRs? Summaries of laboratory TMR analysis suggest that nutrient content as evaluated in the laboratory can vary substantially from what was formulated or assumed to be fed. While a complete review of all possible reasons for TMR nutrient content variation would be exhaustive a simple example is provided in Table 1. 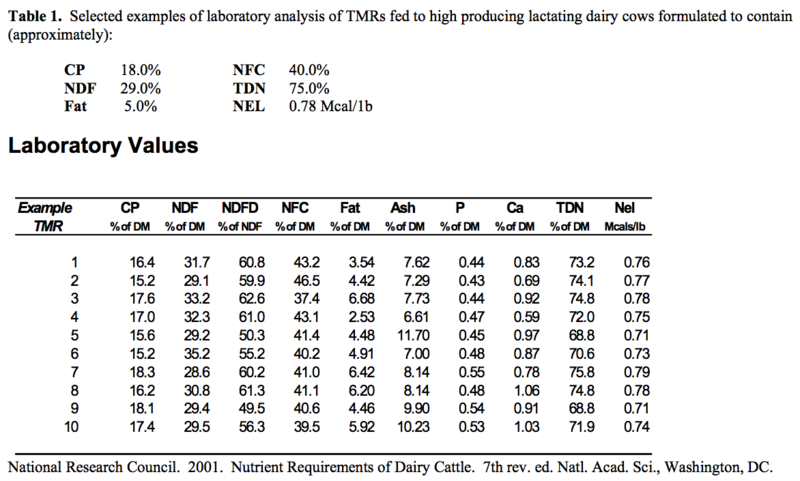 It is not uncommon for TMR nutrient densities to range 3-4, 5-6, 7-10, 4-5 and 5-6 percentage units from formulated values for CP, NDF, NDFD, Ash and TDN respectively. What are the limitations of evaluation TMRs in the laboratory? Laboratory TMR analysis only measures the chemical or nutrient densities in a TMR diet. Animal performance may be influenced by dry matter intake, physical factors (particle length, grind size) and qualitative factors (mold, fermentation) in a TMR, which are not routinely evaluated. In addition TMRs that are not homogeneous are extremely difficult to sample and laboratory evaluation is discouraged. Conditions making laboratory analysis of TMRs difficult include, partial TMRs which are top-dressed, TMRs containing frozen chunks of silage and TMRs containing excessive amounts of long dry forage. How is a TMR sample taken? Mix TMR as per normal procedures. Distribute TMR in bunk to appropriate group. Immediately after distribution, fill a 5-gallon bucket with handfuls of TMR from the top, middle, and bottom of the TMR windrow from the entire length of the TMR windrow. Quickly tip the 5-gallon bucket upside down on a large clean surface and lift bucket up. With a thin piece of wood or sheet metal, cut the coned TMR sample in half. Discard one-half of the sample and submit the remaining one-half of the TMR (~2-2.5 gallons) to the laboratory for analysis.